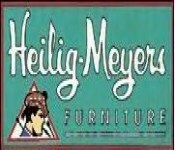 Heilig-Meyers was a chain of retail furniture stores founded in 1913 in Goldsboro, North Carolina H.A. Heilig and J.M. Meyers. At their peak in the 1990s they had over 1,000 stores in the U.S. and Puerto Rico. Over Expansion led to the companies demise in the late 1990s and in 2000 they filed for bankruptcy.